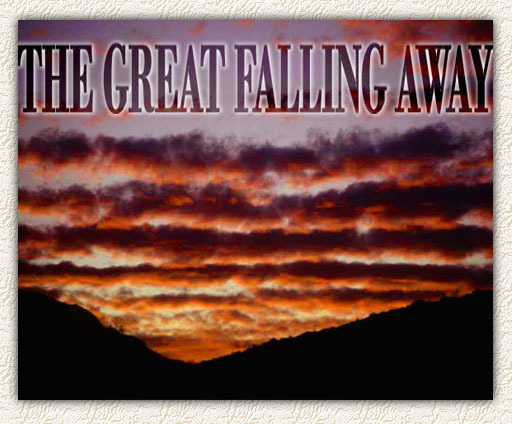 The Great Falling Away Today | Called Out: Now What? We are now living in the time of the great falling way: “Let no man deceived you by any means: for that day (the coming of the Lord Jesus Christ) shall not come, except there come a falling away first” (2 Thess. 2:3). “Falling away” simply means that people turn away from faith in God and begin trusting other things. These other things become idols in their hearts, “golden calves” which they depend upon to lead them through this life and then into heaven. People who have fallen away begin calling something church that is not the church. They begin calling people Christians who are not Christians. Almost every funeral service is preached today as though the person who died has gone to heaven. But the Bible says, “straight is the gate, and narrow is the way, which lead to life, and few there be that find it” (Matt. 4:17). When the children of Israel saw that Moses, their leader whom God had chosen for them, delayed in coming down from the mountain, they tore off their golden earrings and brought them to Aaron. “And he received them at their hand, and fashioned it with a graving tool, after he had made a molten calf: and they said, These be thy gods, O Israel, which brought thee up out of the land of Egypt” (Ex. 32:4). The fleshly hearts of the children of Israel needed a god they could see with their eyes and a god who did not impose disciplines upon them. Then they could fulfill their fleshly lusts and be religious, too. So it is today. Many of the churches and denominations of today began as genuine movements of the Spirit of God. The Holy Spirit moved Martin Luther through the Word of God as he received a fresh word from God for his day. As this “new light” was spreading, more and more people saw the same truths that Luther had seen. These people gathered around this light and treated it as if it were the whole gospel. The result was the formation of a new religious structure, both in doctrine and organization, which later became the Lutheran denomination. Generally speaking, those who follow Luther will accept only the light he had. The amazing truth is that if Martin Luther were alive today, he would be diligently seeking for more light from the Word of God. Almost every religious structure in existence today began in this same way. Many of the traditions developed by religious structures were started with good motives. Through the years they have become so ritualized that the Holy Spirit can rarely work through them any longer. For example the “mourner’s bench” was used by the Holy Spirit during the ministry of Charles Finney. People would come in repentance and prayer to seek for God for hours or days, until their hearts were changed by the Spirit and power of God. After that the Salvation Army used the mourner’s bench as they called multitudes to repentance. Today “walking the aisle” or “raising your hand” has replaced the mourner’s bench and people “pray the sinners prayer” to be saved, but it is seldom that you see brokenness over sin and true heart repentance in those who come to join the church. The hearts of unsaved church members by the millions blindly trust their church doctrines and programs, which have become their idols (golden calves), to lead them to heaven. By so doing they have blinded themselves to many of the truths of God’s Word. People whose hearts are set on pleasing their flesh nature need a physical, tangible God. Today this need is fulfilled through a form of godliness manifested by many religious organizations. These, like Aaron’s golden calf, have been fashioned by the hands of religious leaders of the past to please men, and are protected by the religious leaders today. The hearts of the people are captured by partial truths and religious slogans. Years of teaching Scriptures that fit into a doctrinal structure have blinded them to the other parts of the Gospel and have given them to the other parts of the Gospel and have given them a false security. They can only see in the Bible the parts of the Bible that fit into their particular structure. Like the Pharisees, they are offended when they hear the other parts of the Bible. When the Word of God is resisted, Jesus becomes a rock of offense and a stumbling stone! “The stone which the builders disallowed, the same is made the head of the corner, and a stone of stumbling, and a rock of offense, even to them which stumble at the word” (1 Pet. 2:7,8). When people look at the Word of God from any standpoint other than God’s point of view, they have tunnel vision. Tunnel vision causes them to gather around only a part of the Word of God rather than the whole counsel of God. They will also have a Pharisaical attitude of “we have all the light.” Then their religious structure becomes an idol in their hearts. They cannot be led out of darkness, because they will not receive any truth that conflicts with their doctrine. This is exactly how an idol in someone’s heart causes a veil to be over their face today. They do not have spiritual eyes to see, or ears to hear, and they cannot understand God’s Word. God tells us in Ezekiel 14:3 “Son of man, these men have set up their idols in their heart, and put the stumbling block of their iniquity before their face: should I be inquired of at all by them? The Pharisees loved their religious system more than they loved Jesus when He came to them. Therefore, the words Jesus spoke could have no place in their hearts; their religious structure had their hearts. If they had loved God and if He had their hearts, they would have received the whole counsel of God’s Word and could have been led out of darkness. However, they could not have receive any new light, because they thought they already had all the light. Therefore, they did not have ears to hear, eyes to see, nor could they understand the rest of the Bible, because their religious system had become their whole source of truth. Many cannot be led out of spiritual darkness today, because their hearts have become too hardened by resisting God’s Word. Jesus said to the Pharisees: “Why do you not understand my speech? Even because you cannot hear my word” (John 8:43). They could not hear, because they had taken only a part of the Word of God and built a religious structure that had captured their hearts. They could not receive any new light, because the words Jesus spoke would not fit their religious structures. In Genesis 11:1-7, the goal of the people who built the Tower of Babel was to build their own city and a tower into heaven. “And they said, Go to, let us build a city and a tower, whose top may reach unto heaven; and let us make us a name.” Their motivation was pride and the result was confusion. That is what Babylon means-confusion—and it was there they all began to speak a different language. How different is it today? Everyone is going to the same place but they are all speaking a different language. See the high corner towers in almost any city (Zeph. 1:15,16). In one corner tower the people will tell you, “I was baptized at birth, confirmed at age twelve. I’m on my way to heaven.” Across the street in another high corner tower people will say, “I went forward as a child, was baptized, and I am eternally secure.” On the opposite corner people will tell you, “I was saved by baptism and am kept by good works. This is the only high corner tower that will take you to heaven.” And so forth. (You add your own and you’ll get the point. Mine) All of these high corner towers have taken a part of the Gospel, perhaps even a good part, and used it as if it were the whole Gospel to capture people’s hearts. This is idolatry. The hearts of the people blindly trust their doctrines rather being led by the Spirit of God into all truth (John 16:13). Congregations are indoctrinated with slogans and a few isolated Scriptures rather than being instructed in the whole counsel of God’s Word, which would lead them to holiness. Echoing through the towers you hear: “Christians aren’t perfect; they are just forgiven”; “Everyone sins”; “Once saved, always saved”; “Well, after all, nobody’s perfect”; “Don’t doubt your salvation; I heard you pray the sinners prayer”; “It’s easy to be saved; all you have to do is follow me in this prayer.” The religious structures today become an expression of a form of godliness through their traditions, doctrines and rituals, rather than becoming an expression of Jesus Christ (which is true godliness). These structures lead people to make a commitment to the structure rather than to Jesus. Then the structure becomes an idol in their (in our, mine) hearts. It does not really matter how the church member lives, or whether they have unforgiveness one towards another. It only matters that they show up for the religious exercises and tithe. The Pharisees were blinded to righteousness and holiness because of their religious structures. Those structures led them after carnal traditions and fleshly desires. Because they were blinded, they could receive no more light from the Word of God. The Word could have no place in them, because God did not have their hearts: “He that is of God hears God’s Words: ye therefore hear them not, because ye are not of God” (John 8:47). It is no different today for people whose hearts have been captured by carnal traditions, which lead people after fleshly lusts. They will hate everyone who brings new light contrary to their religious structures: “But if our gospel is hid, it is hid to them that are lost: in whom the god of this world hath blinded the minds of them which believe not, lest the light of the glorious gospel of Christ, who is the image of God, should shine unto them” (2 Cor. 4:3,4).Satan and the powers of darkness blind the minds of all who receive their lies. The Word tells us: “And this is the condemnation, that light (Jesus Christ) is come into the world, and men loved darkness rather than light, because their deeds were evil. For every one that doeth evil hateth the light, neither cometh to the light, lest his deeds should be reproved. But he that doeth truth cometh to the light, that his deeds may be made manifest, that they are wrought in God” (John 3:19-21). As long as we love the evil deeds of our flesh, we will shrink back from Jesus Christ, but we come to the light when our ambitions is to please God more than anything or anyone else. Every time you read the Word, you make a choice. Either you will continue to love rebellion and walk after the flesh and the ways of Satan, or you will come to the light. When you come to the Lord Jesus Christ and begin to love Him and the ways of God, you will walk in obedience and be perfected in holiness. But if you have a stubborn heart, you will shrink back from the Word of God and choose to continue to live in fleshly rebellion. Religious towers are being built today by people who are seeking to make a name for themselves, just as the people did when they built the Tower of Babel. They are almost never aware that they are being motivated by pride and greed—the works of the flesh. Pride, which is a perverted self-love, never makes a name for Jesus. A proud man becomes more proud, because he helps God out in the strength and works of his flesh. He believes that religious activity is godliness. People who have fallen away are totally unaware of this deception. Loving pride and greed is the very opposite of the purpose of Christ who said, “This is My commandment, that ye love one another as I have loved you” (John 15:12). To continue to love pride and greed is to continue to love the nature and character of Satan. Pride and greed were the idols in the hearts of the false teachers in 2 Peter 2. If a person loves pride and greed, he will compromise the Word of God, and he will exploit his congregation to fulfill his love for pride and greed. His heart will seek to build a self-image and reputation more than the image of Christ. The motive in his heart is selfishness instead of love, because he has never truly repented and turned away from the sinful flesh nature. His prideful and greedy flesh has simply become religious, and it now seeks to share the glory with God. We are supposed to repent and turn from pride and greed when we come to follow Jesus. Very good article. Too many people put their trust in man-made organizations and not in the Scriptures and the power of the Holy Ghost. hi Tim, Yes, and thanks for your comments! You know, this is just the first chapter of a whole book… I put the online book link at the end of the post. I have listened to Milton Green for years, he one of few that God has been speaking through in these last days, of course without the Holy Spirit giving us ears to hear, and without coming to God with all your heart, you won’t endure the wonderful work He desires to work in you so you can hear His voice. I recommend reading this book, as you run from the babylon system as hard as you can !